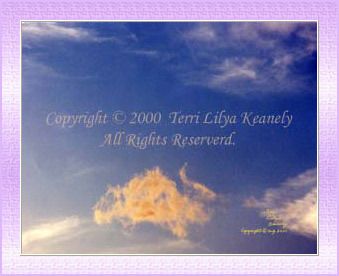 Heaven and Earth Photo Collection, Inc.
Tee Rah© is a Love Being, Protector Being and Helper Being. She sends lots of love to children and adults, especially to families to help them become a cohesive unit. She also protects people from harm's way. Carrying her picture can help an individual to become aware of impending danger. She enjoys helping people to be happy, positive and full of joy. The quality of this image has been reduced for display on the Web. No part of the photographs, taken by and information written or spoken by Terri L. Keanely, such as, but not limited to "A Look Into The Kingdoms of Heaven and Earth," other photographed, written printed spoken, audio or visual recordings, or filmed materials, whether copyrighted or not, shall be reproduced or duplicated in any visual, audio, electronic, mechanical, form, or by any means whatsoever, not limited to photocopying, scanning, recording, computer generated images or photographs, or any other system used for information transmittal or storage or retrieval now in use or yet to be invented, nor shall it be utilized in any form or by any means for any reason without the expressed WRITTEN permission of Terri L. Keanely.